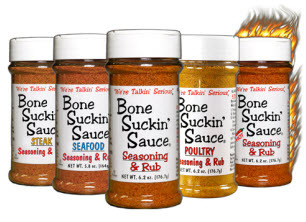 Bone Suckin’ Poultry Seasoning & Rub, 2 Tbsp. In a skillet, heat grapeseed oil to medium high. Combine crushed rice cereal and Bone Suckin’ Poultry Rub in one medium bowl. Whisk eggs in another medium bowl. 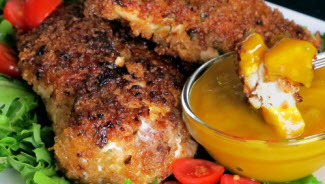 Dip chicken breast in egg, coating it well. Next, roll the breast in rice cereal with Bone Suckin’ Poultry Seasoning. Place breast in skillet with hot oil and fry 10 minutes per side. If the chicken is browning too quickly, turn heat down to medium. Serve with Bone Suckin’ Mustard for dipping. Recipe serves 4. * Chicken may be baked in the oven; just omit the grapeseed oil, lay chicken on a parchment paper lined baking sheet and bake for 30 minutes at 350°.